Like any game, in order to become an expert blackjack player, you have to put in the time to practice blackjack and develop your skills, as such, it is very important to prepare your blackjack strategy from the most basic one, into advanced betting blackjack strategies. Basic strategy helps a player achieve the theoretical house edge by optimizing their play. Studying blackjack basic strategy charts is important because it gives you the information needed to achieve optimal results. If a blackjack variant has a theoretical return-to-player of 99.50% and you achieve the optimal strategy, then you still expect to lose $0.50 for every $100 wagered. Card counting is an advanced strategy which overcomes the house edge. Since Edward Thorp published “Beat the Dealer” in 1962, blackjack strategists have been refining card counting theories to achieve the best results. Card counting is an advanced strategy which requires you to combine several skills at once. While the basics of the game are fairly straightforward making it accessible to anyone walking into the casino, the truly top players will have systems and strategies which have been perfected over years of study. Before you can get to these levels the basics must be in place first, so here you can find some simple advice to improve the foundations of your blackjack betting strategy. First off, this article will talk about using basic blackjack strategy and how you can start practicing blackjack with charts when you are not in the casino. Then, it will review the blackjack training programs and software before wrapping with how playing on online casino sites can help you develop as a blackjack player. To refine you blackjack betting strategy, you’ll need to study basic strategy charts. Look for printable Internet blackjack strategy charts to study and memorize. Remember that each variant set of rules has its own optimal strategies, so one print-off blackjack chart does not work for all varieties of blackjack. Armed with blackjack strategy and practice, you can walk into a casino with confidence. Online blackjack betting strategy is a bit more complicated. Blackjack played in online casinos with a random number generator (RNG) reshuffle the deck after each hand. While basic strategy still produces optimal results, card counting does not work when a shuffle happens between each hand of cards. All is not lost. Live dealer blackjack allows card counters to gain an advantage, though, so those who plan to use advanced blackjack strategy should practice card counting, then head to the live casino section of an online casino and play live blackjack online. Card counting won’t give you a positive expectation if you don’t read the basic strategy charts, though. Optimal blackjack strategy narrows the house edge, so advanced blackjack strategies can give you the edge. Practicing blackjack strategy on the Internet is the foundation of your success. Blackjack betting strategy should be at the core of any serious blackjack players. The basic blackjack strategy charts consist of the different decisions proven to be the most profitable in any given situation, through a series of mathematical calculations. 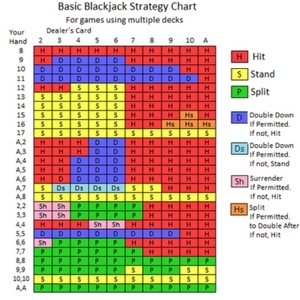 Most people attempt to memorize these blackjack charts, which helps with the social aspect around the blackjack table and allows the decisions to come automatically. If you are not yet confident doing this, it is fine to use the strategy charts at the table, although if you do this make sure you get the right chart for the game you are playing. To practice blackjack with the charts all you have to do is deal out hands at home, play them through and check your decisions against the chart. This way you will soon improve you basic strategy knowledge, which you can then take to the tables. Remember these key points before playing online blackjack in a live casino. Follow these steps and you’ll have the most success in your Internet blackjack career. Study Basic Strategy: This is the foundation of success at blackjack. It achieves optimal return-to-player. Study Card Counting: Basic strategy is not enough. The casino still has a house edge. Counting cards provide the edge over the casino. Practice Blackjack Strategies: You must combine basic strategy and card counting to attain an edge. Neglect either one and you lose. 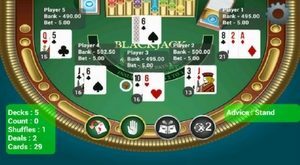 Online Blackjack RNGs Thwart Card Counters: Online blackjack using virtual graphics and RNGs can’t be beat, because the RNG reshuffles the deck each hand. Play Live Blackjack: Instead, play live dealer blackjack, which uses real-life dealers who deal real cards. This restores card counting to importance. Blackjack Strategy Charts: Study one basic strategy chart at a time. Master one version of blackjack, then move on to another. Blackjack strategy requires players to make several decisions after seeing their hole cards. We provide a breakdown of the various basic strategy charts players should study and practice below. In those charts, we give instructions. Use the blackjack glossary below to understand those instructions. Hit: Asking for another card. If you want to improve your hand, then you ask for a hit. Stand: Not asking for another card. If you believe your hand is good enough, then you stand. Bust: When your card combination is 22 or over. This is an automatic loss. The fact the dealer goes after the player (and thus a player can bust first) gives blackjack its house edge. Splitting Pairs: When you receive A-A, K-K, 2-2, and so on. In most blackjack games, you can split the pair. Whatever you wagered on the original bet, each new hand has the same size bet. Some games limit the number of splits. Doubling-Down: When you receive an advantageous hand and you double the initial bet, it’s called doubling down. Surrender: Some games allow players to surrender after seeing the dealer’s up-card. When you surrender, you lose half your initial bet but retain the other half. Insurance: Hedging your bet. When taking insurance, you receive a 2:1 payout if the dealer wins when the dealer showing an ace and receiving a natural 21. Because the odds of hitting a natural 21 are roughly 1-in-3, taking insurance is a sucker bet. Splitting is a key part of the strategy in blackjack because it gives players two advantageous hands to bet on instead of one. Unless mentioned, “Hit” when holding the pairs below. Players should always split with aces and 8’s. They should never split when holding 5’s or 10’s. Otherwise, most of the time splits happen when the dealer is showing numbered cards in various ranges. Splitting Aces: Always split aces, if allowed. Some casinos either limit splitting aces or do not allow split aces. Splitting Eights: Always split a pair of 8s. These combine to make 16, which is a bad hand to play. Splitting Tens: Never split tens. These cards form a 20 and it’s a good bet to win the hand. Splitting Nines: Split a pair of 9’s when the dealer holds 2-6 and 8-9, but not when the dealer holds a 7. When Holding 7’s: If you hold a pair of sevens, split when the dealer is showing a 2 through 7. When Holding 6’s: If you hold a pair of sixes, split when the dealer shows a 2 through 6. When Holding 5’s: Never split fives. Instead, double-down when you hold a pair of 5’s. When Holding 4’s: Split a pair of fours when the dealer shows a 5 or 6. In any other case, hit. When Holding 3’s: Split when the dealer is showing 2 through 7. When Holding 2’s: Split when the dealer is showing 2 through 7. New blackjack players need an understanding of the difference in “soft totals” and “hard totals”. A soft total is when you hold an ace in hand among your first 2 cards. Because an ace can be either a “1” or “11”, if you get a card that would otherwise bust your hand, the ace can always become a “1”. That means you never bust holding “soft 15” or “soft 16”, where it would be a big danger with a hard total. For that reason, there are separate charts for soft hands and hard hands in blackjack. Soft 20: The player always stands. Soft 19: Always doubles against a dealer 6. Stand against all other dealer cards. Soft 18: Should double against the dealer 2 through 6. Hit on 9 through ace. Stand when the dealer shows 7-8. Soft 17: Doubles when the dealer is showing a 3 through 6. In all other cases, hit. Soft 16: Doubles when the dealer is showing a 4 through 6. In all other cases, hit. Soft 15: Doubles when the dealer is showing a 4 through 6. In all other cases, hit. Soft 14: Doubles when the dealer is showing a 5 through 6. In all other cases, hit. Soft 13: Doubles when the dealer is showing a 5 through 6. In all other cases, hit. A hard total is when you do not have an ace among your 2 hole cards. Also, if you had an ace, but had to use it as a “1” after taking a third card, then the hand is now considered to have a hard total. For instance, you hold an Ace-5 as hole cards and take another card, which is a face card (10). You now hold a “hard 16”, because the ace became a “1” to avoid busting. Here are your blackjack strategy tips for hard totals. Hard 17: Always stand with a hard 17. Hard 16: When holding a hard 16, stand when the dealer shows 2 through 6. Hit in other cases. Hard 15: When holding a hard 15, stand when the dealer shows 2 through 6. Hit in other cases. Hard 14: When holding a hard 14, stand when the dealer shows 2 through 6. Hit in other cases. Hard 13: When holding a hard 13, stand when the dealer shows 2 through 6. Hit in other cases. Hard 12: When holding a hard 12, stand when the dealer shows 2 through 6. Hit in other cases. Holding 11: Always double when holding an eleven. It’s a high chance of hitting 21. Holding 10: Double when the dealer shows a 2 through 9. Hit in all other cases. Holding 9: Double when the dealer shows a 3 through 9. Hit in all other cases. Holding 8: Always hit when your hand is a hard 8. Surrender is a legitimate strategy in a few cases when playing blackjack, though many players surrender far too often. Follow the simple instructions below to know when to surrender in blackjack. Don’t confuse surrender with insurance, which is an entirely different concept. Unless you are an excellent card counter (and only then in rare situations), never take insurance. Insurance in blackjack is a sucker bet. 16 Surrender: Always surrender holding a 16 if the dealer holds a 9 through Ace. Don’t surrender with 16 otherwise. 15 Surrender: Surrender when the dealer is showing a 10. Don’t surrender with 15 in any other situation. It doesn’t matter how great your blackjack strategy is if you don’t study and practice before you play blackjack for real money. Many players wanting to practice blackjack betting strategy do better with training programs or blackjack strategy practice software. For those players, I’ve included a section on blackjack training programs. The list of the best blackjack software includes systems which teach card counting, as well as blackjack basic strategy trainers. I suggest you study online blackjack betting strategy by selecting the blackjack training programs listed below and practicing using the software application. Players learn in different ways, but Casino Verite and CVData are proven systems designed to help players practice blackjack betting strategy. QFIT offers tools to help players analyze their blackjack sessions while providing a variety of suggested card counting methods amateur blackjack strategists can practice. Arguably the three best blackjack practice software packages are designed by the same company, though I’ll include free blackjack strategy training software for players. The best blackjack programs are designed by QFIT, which is head-and-shoulders above the rest of the competition. QFIT’s blackjack simulation software provides a detailed analysis of card counting systems, along with expected return data on any set of blackjack rules you can devise. The high-end blackjack software is going to cost about $200, while you can find analyze programs in the $50 to $100 range. Besides the two software programs listed below. QFIT also produces CVCX Blackjack Analyzer, the fastest blackjack simulator on the market. I also include one example of freeware blackjack practice software for players on a budget. On the internet, you can find many useful blackjack tools including training programs. While these play like regular blackjack games, they also tell you when you are making a mistake. You cannot wager anything on these games, although there is usually some kind of credits involved allowing you to essentially keep score. These blackjack trainers typically operate according to basic strategy, instantly giving you feedback on whether or not you are carrying out the right actions. The better training programs allow you to change different aspects of the game, such as changing the number of decks in play or allowing re-splits and surrenders. Some trainers that do not give you any feedback at all and are not worth bothering with as they are just simple blackjack games, usually with poor graphics. If you are getting more serious about the game you can also purchase some specialist blackjack programs. Software like Casino Verite and Blackjack Gold have been used by top players and scholars of the game in order to perfect their theories and strategies. One of the many advantages these powerful tools have is that they can successfully help you learn to card count, as well as play and practice for real money blackjack. While the full software comes with a deserved price tag, some packages allow you to download a Lite version for free. Casino Verite (CVBC): Casino Verite Blackjack Card Counting Game Software Version 5.6 is considered the ultimate blackjack practice tool by many players. Designed by QFIT, Casino Verite has 500 game options, 37 drills, dozens of tables, and over 1,000 games included. Sells for $95 on Amazon. CVData Blackjack Simulator: CVData by QFIT is a more complex blackjack practice program. Up to 300 billion rounds of blackjack can be simulated on the CVData software. It has do-it-yourself graphs, optimal bet calculation, “wonging” and backcounting, and even true-counting unbalanced strategies included. Sells for $180. MGP Blackjack Analyzer: MGP’s Blackjack Analyzer is a blackjack advanced strategy practice tool for players who don’t have $100 to spend on card counting software. MGP is freeware that only runs on Windows computers, but it provides analysis of any set of blackjack rules, showing the house edge of rule combinations, and whether those blackjack games can be beaten. The most realistic way people can find to practice blackjack is by playing on an online casino. Many of these, offer play money tables or practice tables which play exactly like their real money tables, only with no risk to yourself. The main reason for choosing an online casino, rather than a free game you can find on a website or download to your smartphone, is that you can guarantee these games are fair. In order to operate these casinos have to be licensed, which normally includes having their software audited for fair play, and many also have their games tested by respected 3rd party companies. While the play money tables are free and great it may help just to have a little something at risk, just to keep interest even when you are practicing. Online casinos have a great advantage here as you can play for $1 a hand or even less, wagers you would not be able to place in most casinos. This encourages you to try your best and stay focused while wagering very little of your overall bankroll. The basic strategy is important, but you’ll need advanced blackjack strategies to gain an advantage over the casino. In the past 56 years, blackjack experts have developed a wide variety of card counting strategies. All advanced blackjack strategies work, but the difference is in complexity and accuracy. Some card counting techniques are simpler to use, but do not increase the player’s advantage as much. Other card counting methods are complex and harder to implement but produce better results. Hi-Lo Count: Level-one card counts require the player to only count in increments of +1, 0, or -1. Level-one counts (like Hi-Lo) are simpler, though still considered an advanced blackjack strategy. Zen Count: The Zen Count uses +2 and -2 cards, along with the traditional +1, 0, or -1 cards. Zen Count is not the only multi-level count of this type, as Omega II and Hi Opt II use similar numbering. 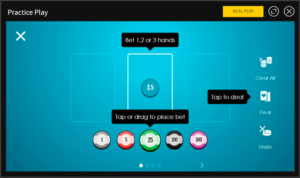 Halves Strategy: The Halves Count uses the above numbering system, but it’s another multi-level card counting method which uses a third option: the +0.5 and -0.5 cards. Counting halves add another level of complexity. In brick-and-mortar casinos, players have to use advanced blackjack strategies while pretending to be uncalculating high rollers. It is not illegal to count cards, but the casino can refuse to allow people to play blackjack in their establishment. They watch for card counters and kick them out when they find them because advanced blackjack strategies like card counting give the player the advantage. Live dealer blackjack played online is your best option, because you can concentrate on complex blackjack card counting without dealers, pit bosses, and security systems dissecting your every decision. The best places to bet while practicing advanced blackjack strategies are at reputable online casinos and mobile casinos which provide live dealer services. Find an online casino which accepts players from your country, then see if it has live casino games. In the United States, online casinos use Vivo Gaming (ViG) and Global Gaming Labs (GGL) to provide live dealer blackjack. In the international online casino niche, casino sites use Evolution Gaming, Playtech, Microgaming, or Ezugi Gaming to provide live dealer blackjack. To help you find good operators, our site recommends a number of top online and mobile casinos which has live dealer blackjack. Find live blackjack online and start practicing advanced blackjack strategies.